The Avengers, also known as the Earth's Mightiest Heroes, is a team of superheroes that appears in comic books (fictional characters) and where created by writer-editor Stan Lee and artist/co-plotter Jack Kirby. The Avengers group appears in publications by Marvel Comics (the first appearance was in the comic book called The Avengers #1 in September 1963). On this page you will find The Avengers Games to play online for free. Choose the The Avengers game that you want to play from the list above. You can also find The Avengers games for kids to play and have fun. BOOKMARK THIS PAGE NOW so you can easily find our site next time you want to play avengers games online. The Avengers originally consisted of Iron Man (Tony Stark), Ant-Man (Dr. Henry Pym), Wasp (Janet Van Dyne), Thor, and Hulk (Bruce Banner). Captain America joined the team later on. Iron Man’s alter ego is Tony Stark. A billionaire industrialist and ingenious engineer, Tony Stark suffers a severe chest injury during a kidnapping in which his captors attempt to force him to build a weapon of mass destruction. He instead creates a powered suit of armor to save his life and escape captivity. He later uses the suit to protect the world as Iron Man. Ant-Man was the alter ego of brilliant scientist Henry Pym, who invented a substance that permitted him to change his size. Janet van Dyne, or the Wasp, is a super-heroine which was among the founding members of the Avengers. She can fly by means of insectoid wings and change her size, from being several inches tall to giant size. The creation of the super-hero Thor is based on the god of thunder’s traits, from the Norse mythology. Hulk is a gigantic, green, irradiated, mutated humanoid monster with incredible strength and an inability to control his rage after a failed gamma experiment for the U.S. military. Captain America is the alter ego of Steve Rogers, a young man who wants to reach human perfection by an experimental serum in order to help the USA in war. So these would be the Avengers. Being so popular, the Avengers games appeared. For example, the last games, the Marvel Avengers games, are very popular. Marvel Avengers: Battle for Earth, appeared in October 2012, to tie in with the premiere of the Avengers movie. The Avengers game was released for Xbox 360 and Wii U and was mainly based on the “Secret Invasion” storyline from the Marvel comic books. The Avengers game received positive review, working as it has been advertised. The Avengers appeared as a response to DC Comic’s team of superheroes, named Justice League of America. The Avengers games have been so popular that the Avenges games online appeared. Every Avengers game online has high-standard graphics and interesting storyline. 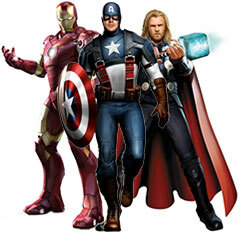 The Avengers games for kids are very appreciated, because of the numerous super-heroes that they bring together. The Avengers games also have a very intriguing plot. For example, the last game stresses on the arrival of some extra-terrestrial villains who can change their shapes and become identical with the Avengers. They also can copy their super-powers. So, it’s a rather difficult task for our super-heroes, to defeat these villains. But they will certainly succeed. Returning to the online games, every Avengers online game is well-worth playing. I mean, there are six super-heroes, with extraordinary powers, that form a group. How awesome is that? No villain could possibly face them, a group of six super-heroes. And no ordinary ones, but the mere heroes of very famous games, the Avengers games. You couldn’t possibly be a gamer without playing these marvelous games. Play the Avengers games and you will be a true gamer, maybe a sidekick for our group of super-heroes.